China's Jin Daxing, ranked a lowly 1,426 in the world, grabbed a shock lead after the first round of the US$3.2-million China Open yesterday in just his eighth European Tour event. Jin Daxing of China plays a shot during the first round of the China Open at Topwin Golf and Country Club in Beijing yesterday. The 25-year-old fired a bogey-free 8-under-par 64 for a 1-shot lead over England’s Matt Wallace and Nino Bertasio of Italy at Topwin Golf and Country Club in Beijing. Swede Alexander Bjork and Scott Vincent of Zimbabwe were fourth, a further shot back. But the day belonged to little-known Jin, who has only made the cut once on a European Tour event, back on his debut in 2012. “I played really well today,” he told europeantour.com. “I’m really happy with my form and I have to say I would give myself 100 marks for today’s round. Last year’s China Open winner, Alexander Levy of France, carded a 3-under-par 69 for a share of 18th. Levy is chasing back-to-back European Tour wins — and eyeing a Ryder Cup spot on home soil — after triumphing last week in Morocco. 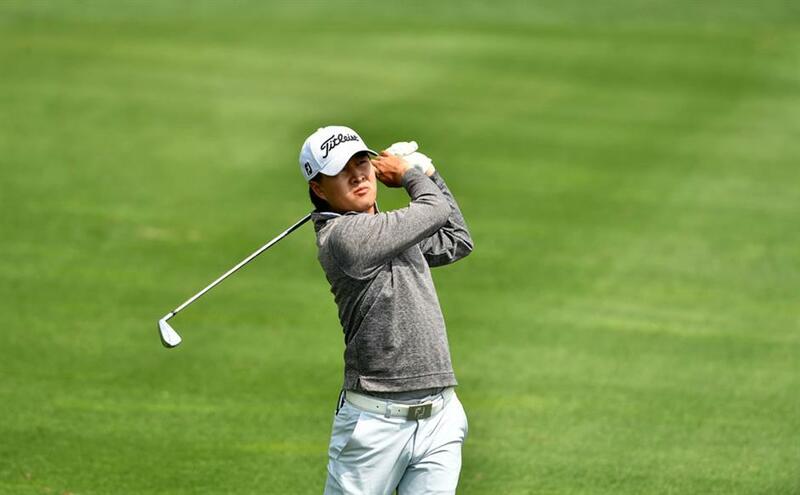 Another home hope, the promising Li Haotong, was tied 33rd after a first-round 70. Japan’s Hideto Tanihara won himself a car after nailing a 197-yard hole-in-one at the 16th on the way to shooting a 72. On Zhangjiagang Island, Jiangsu Province, Thai players dominated the top of the leader-board during first-round play at the Sun Car Zhangjiagang Shuangshan Classic yesterday as Saraporn Chamchoi opened with a tournament record 6-under 66 to set the early pace. Kanyalak Preedasuttijit (67) was one shot back at the 800,000 yuan (US$126,500) China LPGA Tour event at Shuangshan Golf Club. Fellow Thai Saranporn Langkulgasettrin was two shots off the pace after a 68, tied with Malaysian Michelle Koh. Defending champion Liu Wenbo opened with a 69 to sit equal fifth with fellow Chinese amateurs Yin Xiaowen and Zhang Yue and Thailand’s Renuka Suksukont.